Many people do not realize how easy it is to make their homes more energy efficient. And not only is it easy to make your home more energy efficient, it can also save you quite a bit of money. Even better, most of the ways you can accomplish this energy efficiency is through DIY projects. These DIY projects do not require much labor and do not require hiring any specialists to help you do them, so they end up being relatively cheap to get done. Conventional ovens are used to cook a lot of meals, but the fact is, they are often not the most efficient option. If the food you are cooking requires a conventional oven, then you have no choice and there is nothing you can do. However, if you can use a microwave, you should, because they not only cook your food faster, but they also use only a fraction of the energy used by a conventional oven. Ditto for pressure cookers, which can cook many tasty meals quicker than a conventional oven. You can also save energy and speed up the cooking process when using the stove by making sure to cover all pots and pans with lids. One easy way to save energy while doing laundry is to be sure to only run your washer and dryer when you have a full load of dirty clothes. Running smaller loads does not make the most efficient use of your water and electricity. Do not forget to clean the lint in your dryer as lint can slow down the drying cycle and cause you to use more electricity to dry your clothes. You might also want to save electricity by letting your clothes dry outside on a clothesline if you have the backyard space and the climate is warm enough. This may seem primitive, but the amount of energy saved on drying cycles, especially if you have large loads of clothing to dry, can add up over the long haul. A great deal of hot and cold air escapes your home through your doors and windows, which causes you to use more heating or air conditioning to compensate. A lot of this can be avoided by sealing off edges and cracks with rope caulk. For a tighter seal, you can use weatherstripping, although that will take a few more dollars to make this happen. You can also save energy by installing a storm window or simply replacing any damaged or cracked windows in your home. Just making sure that no air can get in or out of your home due to faulty windows can make a noticeable difference in the amount of heating and cooling you will feel when necessary to use. When it comes to Vancouver heating and cooling, taking measures to decrease how much you use your air conditioner or home heating system is imperative for cutting energy costs. One way to do this is to install ceiling fans, which use up far less energy than air conditioners. Ceiling fans may not be the most realistic option on a 90 degree day, but if you can use them on some moderately hot days instead of turning on the air conditioner, the energy savings will be big. You should also go out of you way to make sure that the air conditioner is turned off when you are not home during the summer and the heat is lowered when you are not home in the winter. There is no need to fully heat or air condition a home when nobody is there, and ensuring no energy resources are used for this purpose can save you a fortune every month. Similarly, if your air conditioning and heating systems are not working correctly, they’re not working efficiently when you do need them. That’s where we come in. Call for HVAC service assistance to ensure you’re saving the most money possible. While Vancouver heating and cooling costs can be very high in the winter and summer, there are other drivers of energy costs, like appliances. Desktops take up significantly more energy than laptops, so if you are able to use a laptop instead of a desktop, that is a great way to save on energy costs. Also, far too many people leave both their computers and monitors on at all times, even when they are not home. This is a mistake as it uses a significant amount of electricity and can add a hefty sum to your monthly energy bill. The same goes for device chargers, which take up energy when plugged into the wall, even if they are not actually charging anything. If you are not charging a device, these chargers should be unplugged. It is also wise to avoid leaving cooling devices like refrigerators and freezers plugged in near something that frequently generates a lot of heat like a stove or a heating vent. The heat generating device can force the cooling device to use a greater amount of energy in order to remain cool. In Vancouver, heating and cooling are the #1 drivers of energy costs, appliances are #2, and a significant #3 is lighting. Incandescent lights are used by a large number of homes, but they are not terribly efficient. LED lights not only last longer than incandescent bulbs, they also use a lot less energy. As an added benefit, LED lights are markedly safer than incandescent bulbs because they do not contain any mercury. Much like light bulbs, upgrading showerheads and toilets is something that takes minimal effort and can pay great dividends in terms of saved energy costs. Low-flow showerheads and toilets are modern devices that expend less water and are reasonably priced. Dual-flush toilets are a terrific option as well, since they allow you to adjust the amount of water used per flush based on whether or not you are flushing away a large amount of solid waste or just liquid waste. 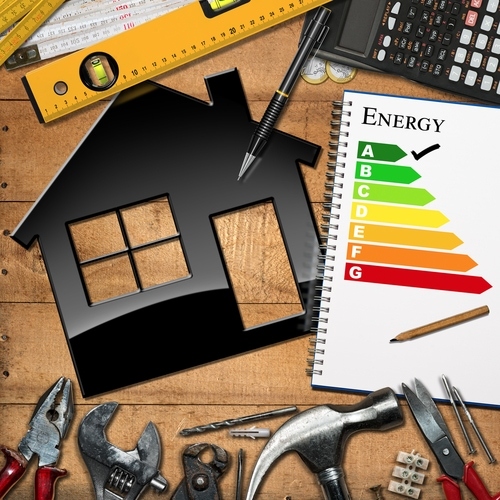 While these are simple DIY steps you can take to ensure your home is more energy efficient while saving money in the process, there are also more involved projects that will save you considerably into the future. For a home energy analysis and to see the best ways we can help you save even more, click here.